If you’ve done any study in garden design you know that one of the things talked about a lot is garden structure or bones. The entire garden is built around that structure. In England for example, many well known garden folks have chosen to purchase properties that have a walled enclosure in which they can construct a garden. We’re not necessarily talking small enclosures. Some of these walled areas that I have seen on the DVDs that picture them, contain gardens that seem to me an acre or more. In addition, these walled areas are usually set in a beautiful English landscape with magnificent views of rolling hills, pastures, and tree lines. Not everyone can have such a picturesque setting with “bones” already in place that lend themselves to a magnificent flower and/or vegetable garden. If you are a regular reader you know that my primary concern when I first started gardening was raising food to eat. ( And raising it without harmful chemicals.) Flower gardens evolved from the vegetable gardens. Over a period of 20 years we dug up at least 3/4 of the 1 1/4 acre property on which we lived. It was all done a day at a time without conscious thought to garden structures or bones. When we moved to our current residence almost 13 years ago the property was unkept. Except for the house, a few nice trees, a garage and an outbuilding there was nothing I would want to keep or use as bones on which to construct borders and gardens. Our property visually and literally merged with that of our 4 bordering neighbors without any divisions. In addition to an abundant crop of poison, it harbored a neighbors old abandoned vehicle and metal trash from years gone by. The only pretty view was of fields on the other side of the neighbors property and a field to the left across the main highway that runs in front of our home. This area gets better every year. The acuba bushes to the left have doubled in size since the picture was taken last year. 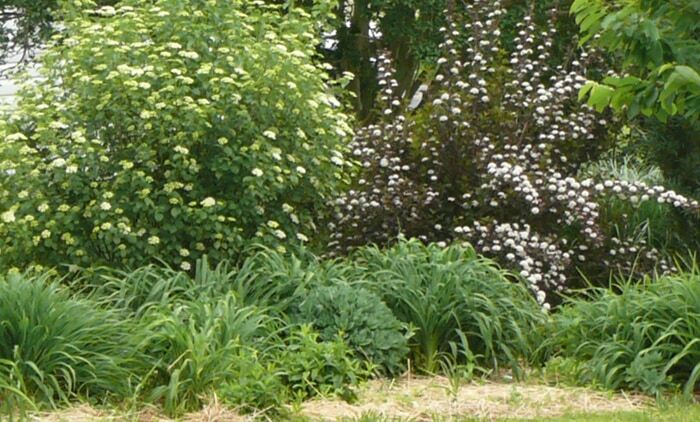 The dogwood (top center) has grown as well. The grasses along the property line get taller by fall. This entire area was filled with poison, motors, old crabpots and other metal trash when we moved here. Shrubs were planted as a barrier on one of the back property lines. They now act as a back drop for flower borders which would otherwise disappear in a sea of grass. The unexpected bonus is looking over the tops and seeing only the beautiful field and tree line across the road. We mentally embrace that as part of our gardens. These shrubs give privacy and will act as a backdrop for the perennials. To complete our back enclosure we economically planted ornamental grasses that are beautiful and give privacy and backdrop at least 9 months of the year until they have to be cut back to allow new growth. Eventually we were able to add a white fence on the front property line that runs parallel to our drive. This is one of the most eye appealing structures we have and is the perfect backdrop for the perennial border than runs its length. 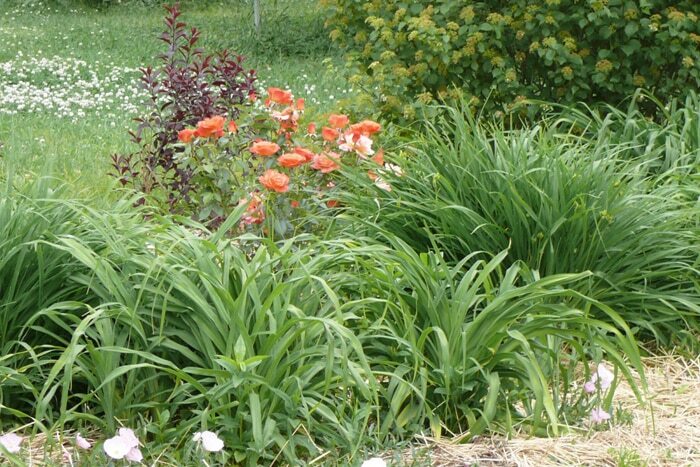 Part of the perennial bed along the fence hides some of the unpleasant view. Each year I add more shrubs to the back borders which will eventually give year round privacy. I use the shrubs and trees to separate plantings of perennials so that each section will be unique and a little area unto itself. We can hardly wait until this dark purple shrub fills in the area behind the rose. I want others to enjoy my garden. But I also want a place of privacy that I can escape, think, and refresh my spirit. The fence, ever green shrubs, trees, hedges and ornamental grasses (now the underlying structure for our borders and gardens) have made that possible. Where could they help you in your yard and gardens? This has totally inspired me to plant along the fence that doesnt have anything. The prior owners of this house (in town) put plants/trees, etc everywhere which is great. The East side has a full row of Rose of Sharon down the fence and it’s great privacy when they are bloomed. 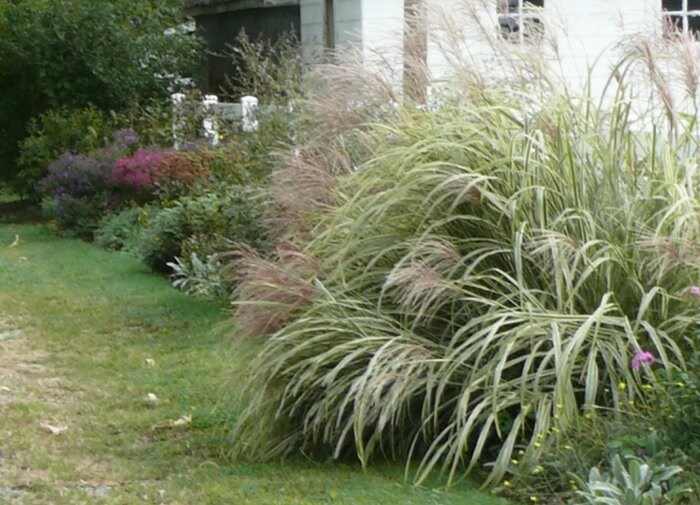 The other side that does have a neighbor has nothing and I see that I can use ornamental grasses, etc to help that. Thanks for the great ideas! Glad I had some ideas that were helpful to you, Alicia. Rose of Sharon is indeed lovely when in bloom and makes a great privacy fence. Also the bees and birds love it. Ornamental grasses will make a great block for the side that has nothing. One word of caution with the grasses — make sure you get grasses than don’t seed all over the place. That can cause a lot of work and problems in the future. The ones that don’t seed — are just great. That way — they keep the look you intended without volunteering others that just make work for you. Try to get those grasses in this year. They take 3 season to reach maturity. 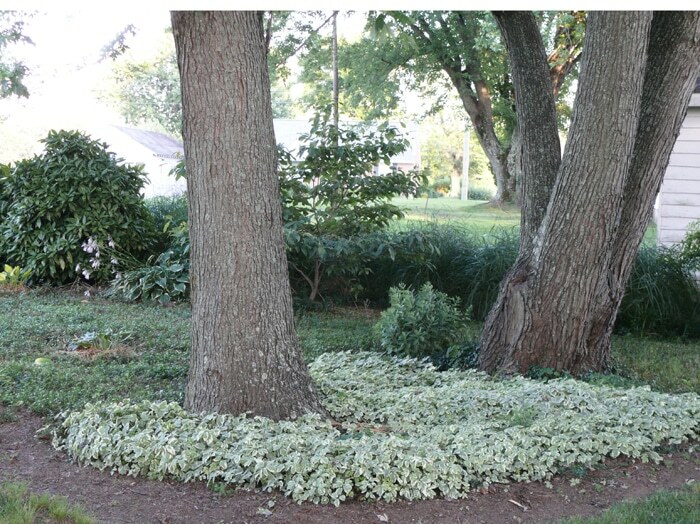 Are you a Virginia gardener? Theresa, What is that graceful white shrub on the right in the picture third from the bottom of this post, please? The shrub is Physocarpus Summer Wine. Sometimes called Ninebark. It is most beautiful when in bloom as you see it in the picture and is also great in the summer because of the deeper foliage. In retrospect, I should have choosen an evergreen for this spot, but now that the shrub has grown so nicely, I don’t want to loose the time — so will leave it there. It’s branches are very thin and twiggy. And in the winter it’s bare. Ah hindsight. It is beautiful in its time, though. I noticed no hydrangea in your garden. Is that for the same reason?